Pythons are non-venomous constricting snakes from the subfamily Pythoninae. 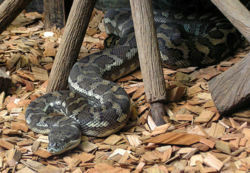 Although similar to Boas, pythons can be distinguishable by the possession of teeth on the premaxilla, a small bone at the very front and the center of the upper jaw. Because of how big pythons actually are, pythons move by traveling in a straight line, which is known as "rectilinear progression." This is accomplished by stiffening the ribs to provide support, then lifting a set of ventral scales and moving them forward so the loose ends grip the surface, pushing the python in a forward motion. This movement also works well in the trees that some pythons seem to slither up often. They only move about 1 mile per hour on open ground. But since they don't have to chase their food they don't need to be able to move quickly. They can live up to 20-25 years in the wild and sometimes less in captivity if not properly taken care of. Pythons lay eggs where they put them into a pile. They coil themselves around the pile of eggs until all eggs have hatched. Since pythons cannot regulate their internal body temperature, they cannot keep their eggs warm. They raise the temperature of their eggs by small movements of the adult pythons body, producing these sorts of movements is called "shivering." There are many documented cases of parental behavior with pythons but this is only one of the very few. Pythons getting ready to breed differ between the different sexes. The female should be at least ten feet and the males should be only about eight feet long before they breed. Before breeding, the pythons are treated to a cool temperature of about (65 degrees F) for one or two months. They do not feed during this time. The purpose of this technique is to create ovulation in the females and increase hormone levels in the males which leads to healthy sperm production. The female python is fed frequently after what they call "the cooling period" and after about three weeks is placed in the male's cage. They will mate by internal fertilization and the mating will last for many hours. The female will not eat during the period and during incubation of her eggs. She will hopefully lay about 15-25 eggs depending on the amount of sperm deposited by the male python. The eggs will be laid around two or three months after the mating process begins. She will coil around the eggs and brood them by shivering. Sphagnum moss can be added to maintain humidity or the warmth of the eggs. The eggs will hatch in about two months. The skin-shedding process is called molting. Before molting, a python will be less active than usual. The pythons eyes will eventually become clouded or a whitish color because the skin covering the eyes is shed along with the rest of the body of the python. The python loosens the skin around their mouth and head by rubbing its nose on a rough surface. The snake then crawls out of the old skin, turning it inside out in the process. Pythons molt depending on its age and how active it is. Young pythons shed more often than older ones do. Snakes that live in warm climate areas are active for longer periods than those that live in cooler climates. As a result, they molt more often. Some pythons of the tropics shed six or more times a year do to the climate. Ball Pythons delicate scales (python regius) Genus:Python. Indian rock python asleep(Python molurus) Genus:Python. Baby African rock python (Python. sebae) Genus: Python. Picture of the fangs of a African rock python (Python. sebae) Genus: Python. Picture of a 16ft 180 pound Burmese python (Python. molurus) Genus: Python.